Have you ever had a moment in your life you just wanted to STOP time? I believe we live in a society where everything is “rushed.” This is hard for my Free Spirit heart because I want to stop people and make them take a deep breath and appreciate that very second. When I was little I refused to wear a watch because I told my daddy that it only limited me. I didn’t like being dictated by a schedule, I was too busy LOVING LIFE! I just wanted to enjoy each moment. Just like everything else in life circumstances, age, life, and maturity can change a person. Before you know it, small moments start getting drowned out by the next event, phone call, or distraction and instead of memories you have regret. My life has had seasons of feeling trapped in my skin and defined by my pant size and my “live in the moment” free spirit turned into praying the moments would pass quickly. My heart is saddened thinking of the days I prayed for BED TIME to magically appear due to a screaming baby. I knew I needed to change my perspective or I was going to miss out on what God had for my life. I started seeking HIS divine appointments and what HE had for me each day, even if I didn’t feel like it. Staying invisible was something I worked hard to achieve but dreaded to accomplish. This weekend we took the family to Dollywood Theme Park in Sevierville TN for my sons 4th bday. Levi is a little daredevil and wanted to ride one of the “kid” roller coasters. He picked the “orange” cart (GO VOLS) and we squeezed in the seat together and his smile pierced my heart. I could literally FEEL the JOY jumping out of his skin. 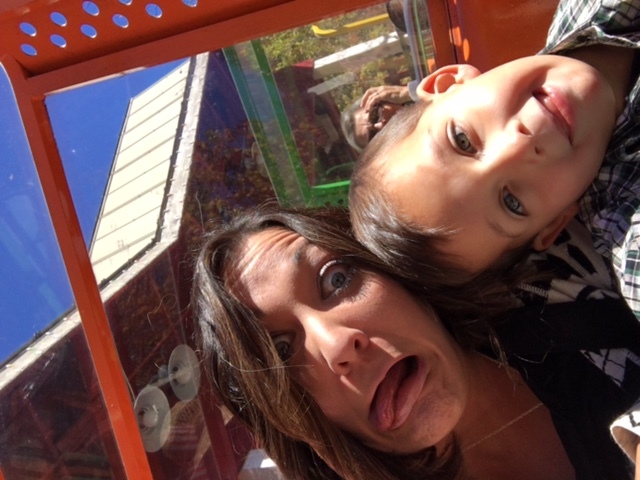 He was very excited to experience this ride! He raised his hands and his squeals turned into continual laughter. If I had a bottle and could of saved that sweet laugh forever I would have. Thinking about this moment brings tears to my eyes and I hope that I never STOP searching for the PURE JOY that God is trying to show me! God beautifully designed our days to enjoy the small moments not just the big Holidays. Tuesday at 3:00 pm can give you more joy then opening a Christmas present on December 25th. Take some time and throw away the calendar, hide your phone, and embrace the very second GOD gave you to breath and LIVE. LIVE ON PURPOSE. Oh how I love this Ashley.When our grand kids are over, they awaken early,and quietly wait for one of us,usually Pappy, to get up. Today, I am up early, a God appointment I NEVER thought would happen to a late sleeper like me.I usually get up between 8-10, and it is 5;45 here!! I know since starting Seemless and joining you at #beautifully designed, God has woken me up to hear His still small voice- what pure joy! I am so proud of you!!!! When I do that my day always is so much better and smoother! I am so glad it blessed you!! This is something I struggle with too but I love when God gently reminds me of it! I love this. I always have this very thing on my heart but manage to allow life to step in the way and secretly wish bed time was near. Pray for a solution to all that steps in my way as I wish to “nourish” my children’s souls. So young and moldable right this very moment. Can’t afford to let such a moment pass by.